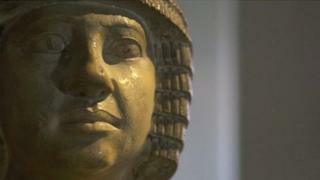 An export licence is to be issued for a 4,000-year-old statue sold for £15.76m by Northampton Borough Council in 2014. Groups in the UK and Egypt campaigned to find a buyer to keep the statue of Sekhemka on public view, spending six months in museums in the two countries. The issue of an export licence to the anonymous overseas owner was deferred several times by the Department of Culture, Media and Sport (DCMS). As neither group could find a buyer, an export licence is now to be granted. "As such, an export licence will now be issued to the owner." Campaigners wanted to negotiate with the owner to agree a loan or buy back the statue with the help of a third party but failed. Spencer Compton, the second Marquis of Northampton, acquired the figure during a trip to Egypt in 1850. The statue was presented to Northampton Museum by his son some years later. Northampton Borough Council sold the statue to raise money to refurbish its museums. The statue was sold by Christie's of London in July 2014 to an unknown buyer. Shortly after, DCMS imposed an export bar which expired on 29 March. The Save Sekhemka Action Group said it was "saddened" at the news, adding: "We did rather expect that the ban would be lifted but it still hurts". The Arts Council, who suspended the registration of Northampton Borough Council over the sale, would not comment. Northampton Council has said the future of the statue was a matter between the owner and the DCMS.